We all need this cleansing, don't we? Praying the picture - and verse - are a blessing to you. Thanks for checking out my post! Don't forget to stop by for more . 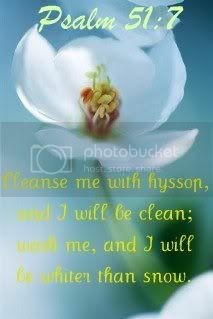 Amen.Indeed we all need the cleansing only the LORD can provide. Every moment, every day. My verse this morning was Romans 8:1" There is therefore now NO condemnation…" His blood continually cleanses. Such a wonderful prayer...one that we ought to remember daily. White flowers always make me want to use that verse also. What a blessing it is.. Oh...I'm SO thankful for God's daily cleansing in my life. And, I'm so THANKFUL that HIS mercies are new every morning!!! So beautiful, Jo. Love it. AWESOME VERSE AND BEAUTIFUL PICTURE. HAPPY WFW!